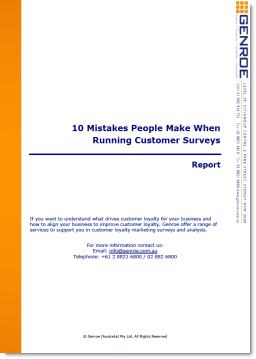 A Fool Proof Recipe For When To Survey Customers? Assuming you have decided that running a customer feedback survey is a good idea, the next question is: when should you send the survey to your customers? There are no hard and fast rules. Different types of businesses and industries have different approaches that work best. However there are some good rules of thumb you can use. Here I break down the different business types and give you a recipe for when to survey your customers for the best outcomes. Regardless of your business type you should always ask for feedback only after the delivery of the product or service. It is only then that customers have experienced your business and can provide valid feedback on their perception. There are some rare instances when you can and should survey prospects (people who have not yet purchased from you) but in general it does not make sense to survey these people. Invite your survey response as close after the moment of delivery as possible. Ideally you will send the invitation the same hour or day that the customer uses your business. That way they will be able to remember exactly what it was like to interact with you. It is often possible to include the link to the survey in the invoice or order confirmation but that will often get overlooked, reducing the number of responses you will receive. Instead, try to send a separate email invite asking for feedback. They will be harder for customers to miss and show that it’s not just after thought in your business. Don’t really exist – if you think your business is here you should look find the smaller transactions in the process and use the cell below. In these business relationships you will have a number of small interactions with your clients over a long period of time, normally at least a few months. Each of these interactions will be to undertake different tasks. In this case you don’t want to wait until the very end of the process to collect feedback from your customers. You should aim to collect it at key points in the process. If you wait to the end of the process you could end up in a situation where your customers is unhappy for a long period and telling all of their friends to avoid your business. If there is an issue you need to know quickly so you can solve it. If you are this type of business you should identify two or three key touchpoints that you use as triggers to ask for customer feedback. That way you get a good understanding of what is happening at each stage of the project and you always know how things are travelling with your customer. In these situations you are potentially interacting with your customer on an on-going basis, perhaps even daily. Here you need to make sure you collect information about your customer’s perceptions of the business but not ask too often. Think about it – if your local coffee shop asked you how good their service was after every coffee you’d get pretty annoyed in just a few days. So the secret is to balance the two areas: getting feedback and not annoying your customer. Ask after a set number of transactions but not fewer than about 4 or 5. Don’t ask more than about every three months. So if you are a Mobile App that is used daily by your customers you should try to gather feedback about every three months from your customers. On the other hand if you are an apartment leasing company you should only ask after every four or five monthly interactions. The only time you would break these rules would be if you or your market went through a major change. For example, in the case of a Mobile App that would be if you released a new version. For the apartment leasing company it would be if you transitioned to new lease management software or maintenance approach. It’s true that some of the examples in this section of the table above could be on-going transaction. For example, we have used the same plumber for 15 years. So, in theory, they might be ongoing transactions. In practice you can treat these relationships as one time transactions. If your business has this type of interaction you should survey your customers after each and every interaction. If you are a plumber you should send a simple customer survey to your customer after every service delivery. Because the interactions are intermittent your customers will not get to that “over surveyed” stage. Putting this into your business process can be as simple as putting a prominent link to the survey in the email that you use to send them the invoice. Make sure that don’t make this an afterthought though: “tell us what you think” after your signature. Make a big deal of if in the body of the email. If you don’t the response rate will be very low. Pretty much every business type will fit into this matrix and you can use it to determine the optimal point at which to survey your customers. Stop now for a few minutes and determine what business type you are and what you would be your ideal survey interval. Then mark out a few minutes in the next week to determine how you will run your survey.